The following detail has been extracted from Historical Reports for RCAF Station Senneterre – 1961. These reports were made available from the National Archives of Canada. A directive from Sector states that intercepts on SAC aircraft are prohibited. This order apparently stems from the fact that recently a GAR equipped USAF F-100A accidentally shot down a B-52 during a training mission. NORAD and SAC have agreed to the resumption of interceptor attacks on SAC aircraft. The agreement stipulates that only unarmed interceptors may be employed. The tentative effective date for this ruling is 1 Jun 61. An incident occurred on April 7, 1961 when a B-52B (53-0380), out of Biggs AFB, TX, was shot down by an F-100A (53-1662) of the 188th TFS, New Mexico ANG. The B-52 was shot down over New Mexico and the wreckage fell to earth on Mount Taylor. 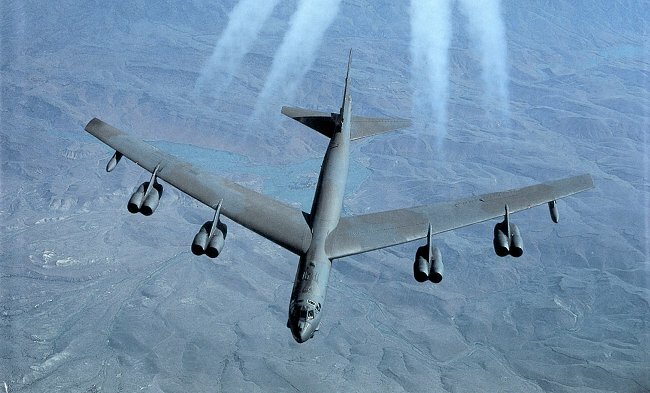 There were eight airmen aboard the B-52 and five survived. The incident occurred while conducting practice intercepts. The Board of Investigation found that a tiny amount of moisture had seeped into a cracked plug in the missile’s firing circuit and although it had subsequently malfunctioned, it had somehow allowed the firing signal to pass to a second missile. This incident caused the inadvertent launching of an AIM-9 Sidewinder missile during the exercise. It was a common practice for fighters to make use of the B-52 for practice intercepts. On 7 April 1961 B-52B (53-0380) "Ciudad Juarez" rose from the runway at Biggs AFB, Texas with Captain Don Blodgett in the left seat. 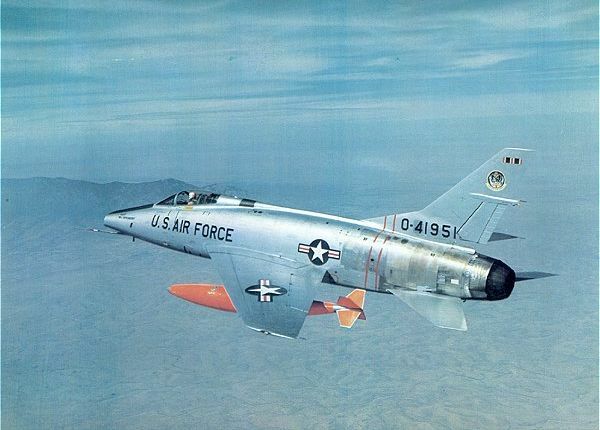 It completed the first navigation leg of its training sortie and then prepared itself to offer some interception practice for a pair of F-100A Super Sabres of the 188th TFS, New Mexico ANG, the first Air Guard unit to fly the type. 1st Lt. James W van Scyoc and Captain Dale Dodd received instructions from Blush First, their ground control interception station, to steer towards the B-52’s position as it approached Albuquerque and complete their armament safety checks. 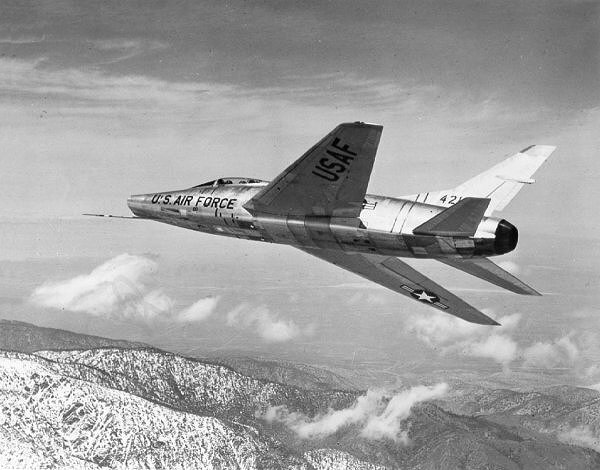 Each F-100A, with its smart black and yellow "sunbeam: markings, carried a pair of AIM-9B Sidewinders on a dual pylon under its left wing. I heard van Scyoc call "Look out! My Missile’s fired". We were on autopilot and I grabbed the controls just as the missile hit. There was a tremendous shudder and the aircraft banked left steeply. Electrical equipment in the right side of the cockpit caught fire. My copilot ejected with the aircraft in a 90 degree bank and in all the confusion I didn’t realize he had gone. I tried to reach the alarm bell control between the two seats to order the crew to bail out, while holding the controls with my left hand to maintain full right aileron and rudder. I didn’t realize the wing had gone and the aircraft wasn’t responding at all; it began to spin down into the clouds and I still wasn’t sure that I had hit the alarm. Later, my crew chief said he had seen the red light flashing as he sat on the steps to the lower cabin. With g-forces building up tremendously, pinning me to my seat I could not raise my right hand from its position near the bail-out alarm but could move it sideways to the ejection handle. The hatch fired and the seat threw me up fifty feet with the B-52 at 600kt. The slipstream tore off my helmet as I left the aircraft. There was another explosion and I went through a ball of fire – it felt like being in an oven. Immediately after that I went through a "bath" of JP-4 fuel as the fuel tanks had broken up in this second explosion. At least this put out the fire but now I was soaking wet with fuel and still on the ejection seat. Assuming a seat malfunction (they told me afterwards I was holding on to it) I reached out to unfasten the lap belt when suddenly I flew out of the seat. However, the inter-phone cord wrapped around my leg so now I was going down through the clouds with a 650lb seat hooked to my leg. I thought it would rip my leg off and I managed to claw the cord free. By now I was falling in a cloud of debris – and a blizzard. I released my survival gear pack, which also automatically released the survival raft. This was suspended about 40 feet below me and, with all the updraughts in the clouds due to the bad weather it acted like a sail, pulling me round in a 180 degree arc. I thought, if I hot the ground sideways, this is it! I couldn’t get to my knife to cut it free but I soon got out of the turbulence and began to fall straight. When I ejected, my left arm hit the hatch putting a big gash in it. The blood was pouring out of this and I was holding this with my right hand, trying to stop the bleeding. Suddenly I saw something white and I hit the ground in a downswing of the parachute and a 30kt wind. It felt like jumping off a two-storey building. I hit so hard that everything in my survival kit: the radio, mirrors, etc. was broken apart from the survival rifle. My original intentions were to get the radio going and tell that fighter pilot what I thought of him! I though everybody must be dead except me. I was still soaked in JP-4, in a 30kt wind and 30 degrees F. I was cold! I tried to stand but when I put my weight on my right foot there was excruciating pain. I found later that I had knocked a two-inch piece out of my pelvis. Also, when I hit the ground I landed on my left arm. There was cactus and pine needles on the ground which packed the wound with needles stopping some of the bleeding. I was going to start a fire but I couldn’t get the matches to work – which was a good thing as I was still soaked in fuel. I lay there and looked at my watch which had stopped at 12 noon when I hit the ground. I kept firing a three-shot distress signal with my rifle every so often. At 3pm a figure came towards me and I recognized my gunner, S/Sgt. Ray Singleton who had landed in a tree half a mile away. He had third degree burns on his hands and face and I put the socks from my survival kit on his hands. He helped me a little further up Mount Taylor (on which they had landed at 7,500 feet rather than the 4,000 feet Don originally assumed) and we laid out our ‘chutes. At 5:30pm the cloud cover opened up and at that moment a T-33 flew directly overhead and saw us. I guess you could call it a miracle. In about 30 minutes an HH-43 helicopter picked us up. Just as they took off Ray spotted another parachute belonging to the EWO, Captain George D Jackson, who had fractured his back. All three were flown to hospital. However, five other crew were still missing and assumed dead as van Scyoc had seen no parachutes. That night and most of the next day foul weather made searching impossible, though the bodies of the two navigators, Steve Canter and Pete Gineris were discovered in the 75ft-crater caused by the B-52 crash. Holes in their helmets indicated that they had died from hits by the Sidewinder’s fragmentation warhead. Student EWO, Glen V Bair, also died. Crew Chief S/Sgt. Manuel Mieras, who was perched on the steps when the missile hit and had no idea on how he got out, had broken a leg on landing, made a crutch and hobbled to a shepherd’s hut where he played cards for 36 hours until rescued. The final crew-member, copilot Captain Ray C Obel, had ejected at 30,000ft using his bail-out oxygen bottle to survive as a 150kt jetstream carried him much further down the mountain. He was found two days later with a fractured back. A Board of Investigation found that a tiny amount of moisture had seeped into a cracked plug in the missile’s firing circuit and although it had subsequently malfunctioned it had somehow allowed the firing signal to pass to a second missile. Don returned to service after ninety days and went on to a varied career in Flight Safety.